The Reality of Islamic Bangladesh: ‘Religious and ethnic minorities are most persecuted in Bangladesh’. Around 10 million Hindus have already left Bangladesh since 1964…. Everyday 632 Hindu people leaving Bangladesh on an average…. There will be no more Hindus in Bangladesh in 20 years: BHBCUC. Ethnic and religious minorities are the most persecuted and oppressed people in Bangladesh, data collected by the National Human Rights Commission (NHRC) has revealed. NHRC Chairman Kazi Reazul Kabir said on Thursday that although the constitution guarantees equal rights to all citizens regardless of their religion and ethnicity, Bangladeshi minorities have been consistently denied their rights and evicted from their own land. In its “Overall Summary of Investigation into the Eviction and Persecution of Minorities”, the human rights body analyzed data from 2012 to 2017. This included recorded instances of communal violence in Ramu in Cox’s Bazar, Shanthia in Pabna, Nasirnagar in Brahmanbaria, Thakurpara in Rangpur, Langadu in Rangamati, Chandpur in Dinajpur. “We have submitted the investigation reports on the communal violence. Our report details who was involved in the attacks but if no further step is taken by the government then these attacks will continue,” the NHRC chairman said. He was speaking as chief guest at a roundtable discussion on “World Human Rights vs the Security and Rights to Land of Religious Minorities and Indigenous People in Bangladesh” at the Center for Integrated Rural Development for Asia and the Pacific (CIRDAP). The discussion was organized by the National Citizen Coordination Cell for the Enforcement of Vested Property Return Act, in collaboration with non-governmental organizations Association for Land Reform and Development (ALRD), and the Urban and Kapaeeng Foundation. 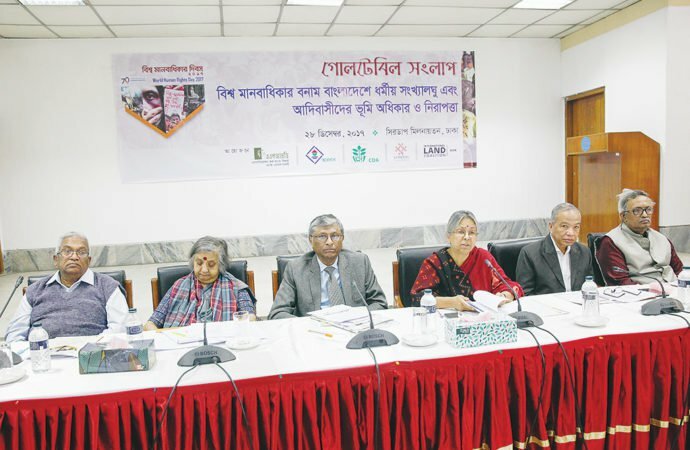 In his keynote paper, Advocate Rana Dasgupta, the general secretary of Bangladesh Hindu-Buddhist-Christian Oikya Parishad*, said the Vested Property Act as the root of the land confiscation epidemic. Rana Dasgupta said that through the Enemy (Vested) Property Act, five million Hindus – almost 40% of Hinduhouseholds in Bangladesh – lost 2.6 million acres of land since independence. “Around 10 million Hindus have already left Bangladesh since 1964, meaning some 632 Hindu people on average have been forced to leave the country every day due to law-induced discrimination,” Rana said. Noted Economist, Prof Abul Barakat, said people are more apathetic to communal violence these days. “With this level of attack on minorities, it seems like Bangladesh is turning into Banglastan,” he said. However, Prof Swapan Adnan, an eminent economist and researcher said land grabbers are not particularly interested in race or religion. Other speakers at Thursday’s programme included Rajshahi-2 constituency MP Fazle Hossain Badsha, ALRD Chairperson Khushi Kabir, and ALRD Executive Director Shamsul Huda. The speakers at the programme demanded a Ministry for Minorities be instituted, along with a national minority commission a minority protection to ensure their rights. They also demanded the CHT Land Dispute Settlement Commission Act to be implemented properly along with the government’s declaration for implementing the Chittagong Hill Tracts Peace Accord. The discussion was chaired by eminent human rights activist, Advocate Sultana Kamal. *Bangladesh Hindu-Buddhist-Christian Oikya Parishad has its name in Eng as Hindu Buddhist Christian Unity Council (BHBCUC). This entry was posted on December 30, 2017 by hinduexistence in Anti Buddhist, Anti-Hindu, Attack on Hindu girls by Muslim, Attack upon Buddhist, Attack upon Christians by Radical Muslims, Conspiracy against Buddhists, Conspiracy against Hindus, Hindu Persecution in Islamic Bangladesh, Hindus under Attack, Save Hindu Minorities in Bangladesh, Save Religious Minorities in Bangladesh, Stop attack on Bangladesh Hindus, Stop attack on Tribal Culture, Stop attack on Tribal People and tagged Adv Rana Dasgupta, Bangladesh Hindu-Buddhist-Christian Oikya Parishad, BHBCUC (Bangladesh Hindu Bauddha Christian Unity Council-USA), Enemy (Vested) Property Act - Bangladesh, Hindu-Buddhist-Christian-Unity-Council, Hindus and other minorities in Bangladesh, minorities are most persecuted in Islamic Bangladesh, National Human Rights Commission (NHRC) -Bangladesh, Prof Abul Barakat.